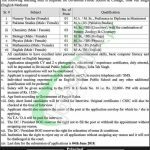 Tap this page for DPS & C Toba Tek Singh Jobs | Divisional Public School & College Toba Tek Singh Jobs 2018 For Teachers Latest. The Divisional Public School & College Toba Tek Singh intends to hire the most well educated, experienced, adroit and meritorious applicants for the Teaching Staff, the service of such applicants are required to fill the vacant situations of (Nursery Teacher (Female), Pak Studies Teacher (Male/Female), Chemistry (Male/Female), Biology (Male/Female), Physics (Male/Female), English (Male/Female)) are required in this school and college to come and surf their skill over there and also get rid of unemployment too. The school and college offer excellent salary package on the basis of DPS & C scale No. 16 Rs. 22000/ per month with an annual increment of Rs. 1520 will be paid to the applicants. Its the English Medium Institute so being English medium it requires the strong interpersonal communication skills and command of the English language is necessary to be had by the applicants. Both male and females are eligible to apply. So, those applicants who are willing to apply have to fulfill the needs of the said jobs fully and than tap to apply. Now, let's have a look on its further details one by one below. Educational & Experience Requirements: For all those applicants who are willing to apply for these teaching posts must be having the overall qualification of M.A, MS.c, MS, BS.c, BS in the following subjects and interpersonal communication skills and full command on the computer is required to hold these jobs meticulously. Age Limit: Age of the applicants will be according to the Govt policy. Interested applicants are required to apply by sending the CV & application with attested copies of all credentials, 2 passport size photographs should be sent to the accurate address. The last date for applying is June 04, 2018. The applicants must mention their contact information in the CV and application. Applications received after due date or incomplete will not be entertained. Only shortlisted applicants will be invited for the written test and interview. The applicants must mention the name of the applied post on the top of the envelope. The authority reserves the right to reject any application form and this action cannot be challenged in any court. So stay connected with this page forever. Address: Principal, Divisional Public School & College, Toba Tek Singh.